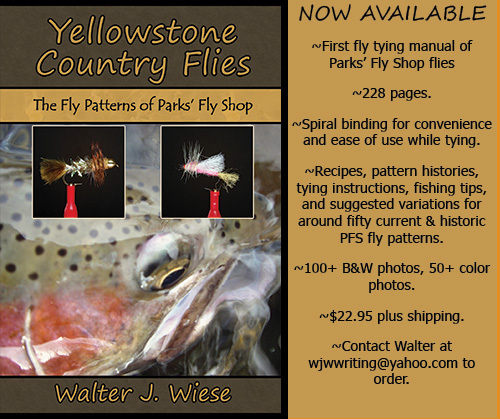 Walter Wiese, head guide at Parks Fly Shop in Gardiner, MT has announced the release of his new book: Yellowstone Country Flies -The fly patterns of Parks Fly Shop. Wally's book should be a big hit so order your copies soon as only 125 copies will be printed in this first printing. The book contains flies from current and past fly tiers for the shop including yours-truly. I highly recommend it, Doug. Summer is coming and it's time to stock up on the trinity of terrestrials; hoppers, beetles and ants. Today, let's talk beetles the most underrated of the three in my opinion. There are all kinds of beetles in the great outdoors but I just tie them in black and tan size #14-18 because that's all you really need, with June bugs and Japanese beetles being my primary target species in size #14-16. I tie #18's in black only to represent a wide variety of the smaller beetles. Oh, and lady bugs too using this same simple pattern but with orange foam for the shellback and a Sharpe marker for the spots on a #18 hook. All you need is some 2mm craft foam and some peacock quills. Use the foam to create the shellback and head and the peacock herl for the underbelly and legs... use some super glue in the process to hold things firmly in place and add a small thin piece of brightly colored foam for an indicator and your good to go. Walter Wiese our head guide at Parks Fly Shop in Gardiner, MT asked me to provide a black and white photo of myself at my fly tying desk for his new book that will be coming out very soon. The book has several of my original fly designs included as-well-as a short bio and photo of each fly tier featured. It should be a great book. I'll be sure to let you know when it will be available, stay tuned! Folks, here is my finished pear wood "lefty spoon"... I am very happy with the way it tured out. The spoon has nice color and the pear wood is much stronger than I thought it would be. When I finished carving I treated it with two coats of raw tung oil. It was a fun and challenging spoon to carve. Carving such a curved piece required paying close attention to the grain of the wood. This is my third spoon. Feathers on the fly... Turkey down!